Employer representatives who are here for a recruiting visit tend to give guest lectures, hold office hours and participate in networking events. Click here to learn about employer visits. Workshops include the resume critiques, practice interviews, LinkedIn setup, professional photo shoots and other opportunities students need to prepare for the job hunt. Click here to learn more about workshops. Employer Information Booths are held on the main floor of the business building and allow students to visit with employers about career paths and job options. Click here to learn more about employer information booths. 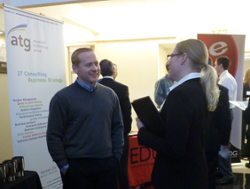 When multiple employers are on campus at the same time, a networking reception will be scheduled as a way for students to meet different employers. Click here to learn more about networking opportunities. 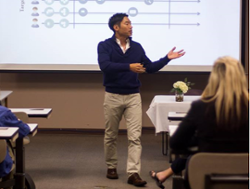 In 2005, the College of Business's (COB) Career Development Program was created and funded by COB alumni serving on the College of Business's Advisory Council. As employers now trying to hire CoB students, these alumni saw the need for students to develop a career focus while in college, including job search training and network building. Returning employers now call the program one of their "best recruiting tools." The mission of the Career Development program is to provide students with the best possible chance to be competitive in the business world by providing workshops; practice interviews; resume critiques; networking events to build their professional network; and effective job search advice from expert staff, business owners and human resource managers. We give employers the valuable opportunity to get to know students by providing campus visits, class visits and the opportunity to host office hours. Our program provides both employers and students the valuable opportunity to get to know each other and with a wealth of resources at their fingertips, CoB students now gain invaluable experience planning and achieving their career goals. 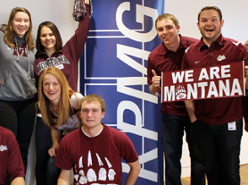 Recruiting Visits from Top Companies to the Gallagher Business Building – One-on-one student appointments, socials, presentations to Accounting, Finance, MIS, and/or Marketing student organizations. We are the only university in the state to provide this year round. Employer and Student Networking Events – Networking opportunities for employers and students: Accounting, Finance, Management, MIS, Marketing, International Business, MAcct, MSBA and MBA. 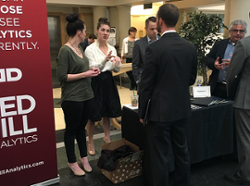 ­Employer Information Booths – Held three times a semester, these mini-career fairs are held in the Gallagher Business Building. Internship and Part-time / Full-Time Openings – We get the word out when you are hiring. Resume Critiques and Practice Interviews. ­And more – we work with each employer to meet their needs.